Iranian-born, American-raised artist Sheree Hovsepian’s work involves drawings, sculptures, and assem-blages. Her conceptual expansions of photographic abstraction manifest in series—most especially in two foun-dational series, Sleight of Hand and Haptic Wonders (both from 2011-13)—that engage photography. Primarily focused on the photogram, Hovsepian foregoes the camera and in her studio exposes photosensitive paper to light. She makes these photograms by par-tially obscuring the paper surface with a sculptural arrangement of opaque materials or by moving found materi-als across the paper’s surface. The activity of making photograms in the darkroom is a performance in itself and the resulting prints are chronicles of her actions. Each photogram is singular; none can be replicated. The images are sculptural documents referencing the three-dimensional objects that occluded the light, and they are draughtsmanlike in the way they are etched with shadows. These “alchemical” performances create traces of bleak and beautiful surfaces. In her current series, Material Gesture, Hovsepian introduces wall-based assemblage to her pho-tographic practice. 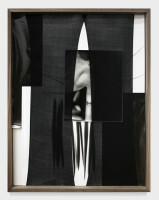 Shown as part of her 2016 residency at the Drawing Center in New York, Material Gesture (A Meditation on Latency) combines fabric, paper, and a large photogram. The title refers to the latent state of an image to be captured on film. The fab-ric veiling the photogram references the artist’s physical movements to cover and uncover the light-sensitive paper in the darkroom. Hovsepian’s nascent assem-blage process is often inclusive of objects such as macramé, woodcarv-ings, and ceramics, all handmade by the artist. Her creative impulses are often released in an intuitive, unmoni-tored way. When I visited her studio last year, Hovsepian told me, “I feel an urge to work with my hands in an additive process as opposed to the way I see straight photography. I approach materials from a kind of naïve perspective that I experience as very freeing and in contrast to photog-raphy, which is more about precision and control.” Hovsepian’s work addresses current matters, but she does so in an unfamiliar vocabulary and by moving beyond binaries and beyond Western mentality. The processes and struc-tures she has developed are, in turn, self-developing. In today’s climate of increasing polarization and fixed identities, she creates an alternative path, building a vocabulary that avoids one dominant visual language. As an artist, I see her navigate issues that many often get lost in. Her work is marked by grace, agility, and power. Rather than dwelling in irony and cyni-cism, she cultivates notions steeped in generosity. The work is benevolent.